[People] close to Paul’s operations said he was deeply involved in the company that produced the [racist] newsletters, Ron Paul & Associates, and closely monitored its operations, signing off on articles and speaking to staff members virtually every day. “It was his newsletter, and it was under his name, so he always got to see the final product. . . . He would proof it,’’ said Renae Hathway, a former secretary in Paul’s company and a supporter of the Texas congressman. The Paulite rationalization has always been that he didn't mean these things published under his own name. And, more importantly, he didn't know. Yet a review of his enterprises reveals a sharp-eyed businessman who for nearly two decades oversaw the company and a nonprofit foundation, intertwining them with his political career. 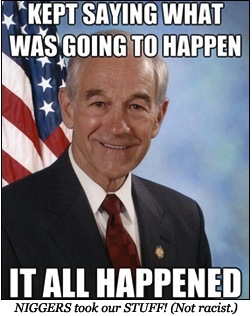 The newsletters, which were launched in the mid-1980s and bore such names as the Ron Paul Survival Report, were produced by a company Paul dissolved in 2001. The company shared offices with his campaigns and foundation at various points, according to those familiar with the operation. Public records show Paul’s wife and daughter were officers of the newsletter company and foundation; his daughter also served as his campaign treasurer. It is unclear precisely how much money Paul made from his newsletters, but during the years he was publishing them, he reduced his debts and substantially increased his net worth, according to his congressional and presidential disclosure reports. In 1984, he reported debt of up to $765,000, most of which was gone by 1995, when he reported a net worth of up to $3.3 million. Last year, he reported a net worth up to $5.2 million. Who can begrudge a man making a buck? Even after surely losing hundreds of thousands of dollars—if not millions—on his failed 1988 presidential campaign? Unless he specifically markets himself to hate groups. Ed Crane, the longtime president of the libertarian Cato Institute, said he met Paul for lunch during this period, and the two men discussed direct-mail solicitations, which Paul was sending out to interest people in his newsletters. They agreed that “people who have extreme views” are more likely than others to respond. Crane said Paul reported getting his best response when he used a mailing list from the now-defunct newspaper Spotlight, which was widely considered anti-Semitic and racist. Dondero Rittberg said he witnessed Paul proofing, editing and signing off on his newsletters in the mid-1990s. If only rational actors actually avoided money tainted by social malice and didn't court it, and if only social malice obeyed rational-actor theory. Or maybe, in the latter case, it did.